Flowers enhance a wedding. They can provide the occasion with color and personality. Fresh and well-arranged flowers can bring life to your décor and wedding ceremony. Moreover, bouquets are used in wedding traditions and customs. One of the wedding customs that has lasted through the years is the bouquet toss. The bridal bouquet is thrown towards her female guests as a sign that she is the next to get married. Alternatives to this tradition include giving the bouquet to someone the bride feels they are indebted or their closest and most loyal friend. Bouquets are also used to compliment the bridal gown. As well as held by her entourage and her flower girls. 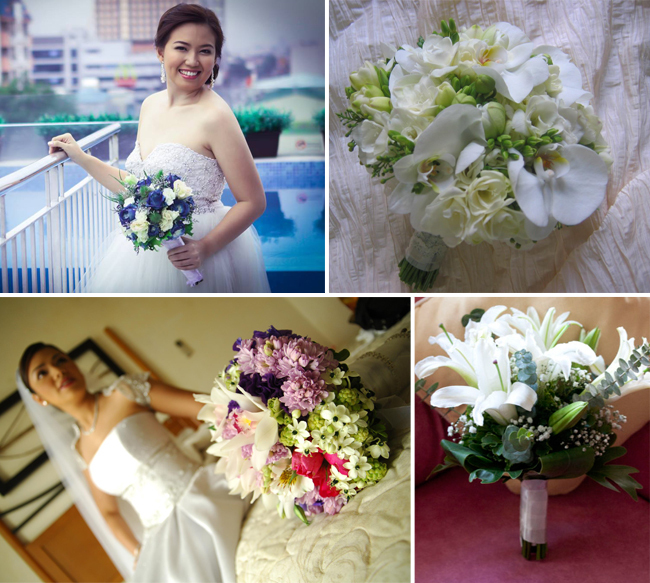 One thing is certain though, a beautiful bridal bouquet is a fixture in nearly all wedding occasions. But did you know there were actually different kinds of bouquets? 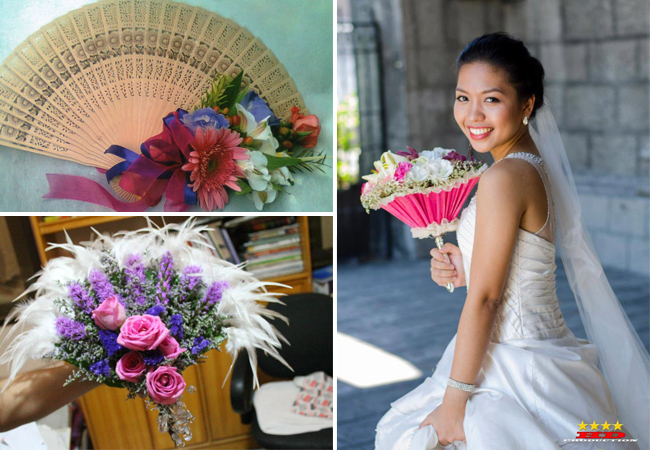 The most traditional of bouquets it can fit both formal and informal themed weddings. As the name implies, the bouquet puts a lot of emphasis on the round shape so the use of round flowers such as roses and carnations are a popular choice. The round bouquet can also come in smaller and bigger sizes depending on the bride’s dress and preference. 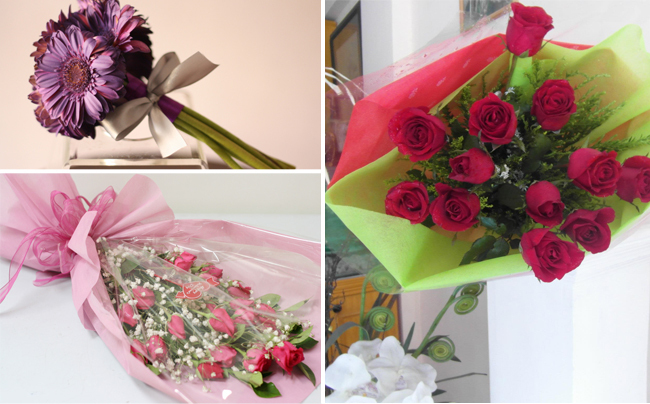 The flower selection can range from a single kind of flower of the same or a variety of colors. Tip: For considering the size of your round bouquet, make sure it doesn’t overwhelm the bride! A petite bride might end up getting drowned by a large bouquet. On the other hand, a small one might make a robust bride look larger. An alternative to the plain round bouquet design would be a Biedermeier. It comes in the usual round shape but the difference is that it has patterns of the same flowers going towards the center creating a ring effect. It’s ideal for brides who would like to retain the round shape but appreciate the structure of patterns. It is similar to the round bouquet (and by some florists, considered as a sub-category). The difference between the posy and the round is that posy are made to be small enough to be held in one hand.. The flowers are bound together by a length of satin, organza, and even lace. There are no restrictions on the type of flowers to use but common choices include roses, carnations, tulips, lilies, and freesias. Unlike other round bouquet variants, it is composed of little to no greenery. This bouquet type is ideal also for bridesmaids and for more casual wedding settings outdoors like the beach or a garden. This is probably the most popular type of bouquet in the Philippines. A Nosegay bouquet usually has fixtures besides the flowers: greens, baby’s breath, pearls, ribbons, and decorative leaves bridged above the bouquet. Like the Posey, the Nosegay is sometimes also considered the variant of the Round—though the standard round shape is not strictly followed. As the name suggests, the cascading bouquet extends downward to create a “waterfall” effect, covering the hands. This bouquet is usually used in formal-themed weddings. What is usually used to create the cascading effect is interconnected flowers by a train of cloth like silk tulle or an English net. Otherwise, wires and leaves can also be used to create the waterfall of “falling” flowers. A similar design would be the oval bouquet. : Although this bouquet arrangement also covers the hands — the design is fuller with compact flowers. Colors of the flowers are usually two toned and neutral as not to be too overwhelming. Just like the cascading bouquet, this arrangement is best for formal weddings and suitable for big ball gowns. This cute bouquet type is ideal for intimate weddings. A round bouquet’s stems are cut off and a handle is attached to the middle to carry around. This type of bouquet is also ideal for young bridesmaids and flower girls since it will be easier for them to hold the bouquet by the wrist. Or allow it to dangle from their grip. Both these bouquet variants are held over the arm—also known as arm sheaf or arm bouquets. However, they’re usually used in very different types of weddings. Loose tied or hand tied are usually bouquets tied by the bride themselves. They’re usually long stemmed flowers that are tied by a simple ribbons or lace. ? rephrase: Long stemmed flowers are the common choice for this kind of arrangement, as well as tied by a simple ribbon or lace. On the other hand, the pageant bouquets are between semi-formal to formal. Most of the time, this arrangement is wrapped in organza or types of wrapping paper. These can range from very elaborate to simple. Think that baskets are only good for the entourage and the flower girl? Basket bouquets can also be used by the bride. Though the choice isn’t popular, you might want to go against the norm if your wedding is more youthful and fun—something less formal. This might also be nice for a beach or rustic themed wedding. Some aren’t used as often but there are also fan bouquets that may be ideal for warmer venues (though whether or not you can use this to fan yourself this depends on how elaborate the flower design is). Another variant of the round bouquet is one called the Tussy Mussy—characterized by the stem of the flowers encased tightly in a tube or a tight bind. These are only some of the basic designs and there is definitely more out there to explore. It’s best to compare both your wedding theme and gown and match it up with a wonderful bouquet. Traditional bouquets are usually the safest but if you have a quirky theme then why not explore all the options? Or better yet, customize your own bouquet to suit your wedding day. If you want to know more about what other designs are out there, take a look at our Wedding Florist and Stylist section in the kasal.com website and browse through the possibilities and consult the experts.